Mithraic temple fresco in Marino, Italy. Second century A.D. When the Aryan tribes swept down from the Russian steppes they brought their gods with them. Some time between 2000 and 1500 B.C.E., these tribes entered India and Iran, bringing with them one particular deity. These people, the Mitanni, gave us the first written reference to Mitra in a treaty between themselves and the Hittites. Signed about 1375 B.C.E., the treaty calls on divine witnesses to pledge its terms. The Hittites called on the sun go. The Mitanni called on Mitra. Mitra had been worshipped by the Iranians for centuries when Zarathustra (we call him Zoroaster, the Greek version of his name) founded the first revealed religion. Zarathustra announced the primacy of Ahura Mazda, the Wise Lord, who was served by the Amentas Spenta, or bounteous immortals. Among these was Mithra, whom Ahura Mazda declared to be "as worthy of worship as myself." Thus Zarathustrian reform did not replace Mithra in the Iranian Pantheon. It merely changed his role. Mithra may also have been worshipped by the Mani. Some branches of Manicheism identified Mithra as the ruler of the second or third emanation (an occultist would say "ray," "aeon," or "sepheroth"). But whether there were actual rites of worship dedicated to him or whether he simply functioned as an anthropomorphic principle is impossible to say. In the Roman Empire, this same deity was called Mithras, and was the central figure of a mystery religion that for almost five hundred years vied with Christianity for dominance. Roman Mithrasism differed so markedly, however, from other traditions that some scholars have claimed Mithras to be a unique deity, distinct from Mitra or Mithra. Although this book deals primarily with Mithrasism in its Roman form, it will demonstrate that there is good reason to connect the Roman Mithras with his other forms in other traditions. The names Mitra, Mithra and Mithras all derive from the Indo-European root "Mihr," which translates both as "friend" and as "contract." While both translations are correct, however, neither gives a full account of the word. "Mihr" itself derives from "mei," an Indo-European root meaning "exchange." But Aryan society did not use the word "exchange" to describe a transaction. The Iranis had a deep reverence for Mithra, as is proved by their reception of the prophet, Zarathustra. Zarathustra is the most important person in the recorded history of religion, bar none. The first man to promulgate a divinely revealed religion. He influenced the religions of Judaism, Christianity, Mithrasism, Islam, Northern (Mahayana) Buddhism, Manicheism, and the pagan Norse myths. Over half the world has accepted a significant portion of his precepts under the guise of one or another of these faiths. At the age of about forty, Zarathustra, a priest in the traditional Irani rites, received a revelation. In it, the many gods of the Iranis were supplanted by a new deity who was the supreme deity of the Good. This deity became known as Ahura Mazda, or the "Wise Lord." Opposed to Ahura Mazda was Aingra Mainyu or Ahriman, the "Angry Spirit," the chief deity of evil. Both deities had underlings and partners. The chief allies of Ahura Mazda were the "Amentas Spenta." Created by the "Wise Lord," these "Bounteous" or "Holy Immortals" included Mithra. Mithra is a much more fully developed image than the rather ethereal Mitra. Unlike the Indian god, we actually have a relief of the Iranian deity. Reconstruction shows Mithra shaking hands with King Antiochus. It is Mithra's attire, however, that is important to the current study. 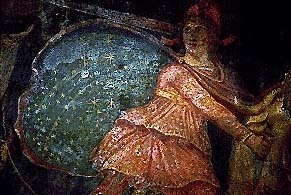 Mithra wears the Phrygian cap, Persian trousers, and a cape. His hat is star speckled (from textual evidence his chariot is similarly decorated). Rays of light emerge from Mithra's head much like a halo. His choke collar is a serpent. This image, or one very like it, will appear again in Rome.